Top: Dark purple Charmeuse silk blouse heavily embellished with beautiful floral work. Round neckline decked with pearls. Amethyst stones embedding work. Front hook closure. Super-soft lining. Piping edges finish. 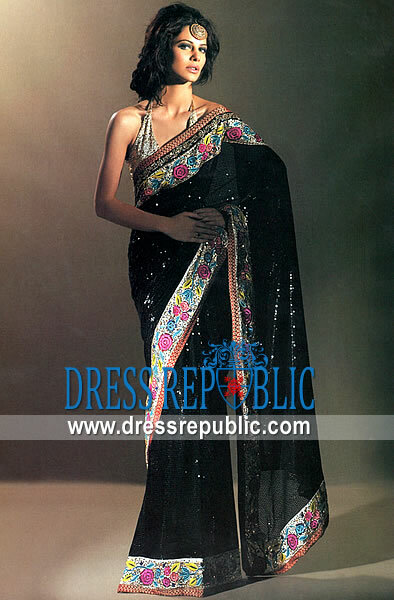 Saree: Dark purple chiffon Saree has heavy shower of small ornamental motifs all over. Delicate beautiful border on pallu and border. Comes with a petticoat. Draped and stitched with belt for easy wear. Embellishments made with dabka, kora, naqshi, sequins, beads, pearls, synthetic amethyst stones, Swarovski crystals, diamantes, marrori and cut-glass. 100% natural pure fabrics. All handmade embellishments. 100% same as shown. Hemming finish.